NOTE: For the last week of the year I'll be showing off and sharing some of my top 5 products from 2012. Including hair, nails, face, misc, eyes, lips and skin. Feel free to let me know your favourite products from each category. Rapid Lash: I actually mentioned this in last year's best eye products of 2011, but I've decided to include it under a miscellaneous category this time. I dabbled with eyelash extensions earlier in the year, and although I loved them they ended up drying my lashes out with many of them falling out. I was left with little stubby lashes and no idea what to do about them. This has once again helped with the condition on my lashes which in turn has made them grow longer. Big love for Rapid Lash and although it's pricey it's something I continuously go back to whenever my lashes get into bad condition. Eylure 101's: I think these have been my favourite eyelashes of 2012. It was a toss up between my other favourites which are the Ardell Demi Wispies. The 101's are the perfect every occasion lash, they are short and curved which adds soft volume to the eyes that doesn't look unnatural or too much. Although I hardly wear lashes these days I do opt for these on a regular basis whenever something special comes up or when Im filming videos for my Youtube Channel. Rituals Yogi Flow Shower Gel: This was another toss up item, I couldn't decide between the Original Source Mint and Walnut Shower Scrub and this but in the end I went with this one. I was introduced to these via a Glossy Box and since then it's been something I've regular purchased. I love the scent of the sweet almond oil and the shower foam style foaming action means it gives a really luxurious wash. I tend to buy this when I see a deal on as £6.50 is pricey for a shower gel but it's one of those things I shouldnt like as much as I do! 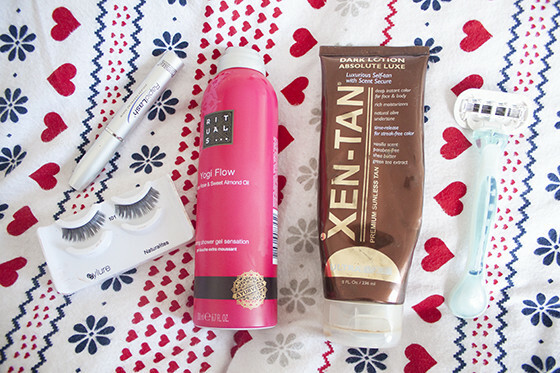 Xen Tan Dark Lotion: I wasn't sure about Dark Lotion when I first tried it but it's completely grown on me. My favourite expensive tanner that gives a beautiful golden glow without pulling too orange on my skin tone. It smells gorgeous and doesn't dry my skin out meaning my skin feeling silky soft and beautifully tanned. I cant rave enough about how much I love this fake tan, I even went as far as paying the hefty price tag to repurchase it after I won some earlier in the year in a goody bag! Gilette Venus Pro Skin Razors: My least favourite beauty product to buy but I've been loyal to these razors most of the year. They provide good on the go no-fuss shaving. It's a really comfortable razor which easy to use and quick at removing hair. I like the disposables as well as the regular Pro Skin ones. A boring one to include in my favourite products of 2012, but my hair grow so ridiculously quickly it's been a life safer! I almost forgot to take a razor on holiday earlier in the year and that would be been a disaster!